There is a wide spread perception that government agencies, in general, produce “poor quality” goods and services. However, there are two points to note in this regard. First, like most generalizations, this generalization also has large number of exceptions, some of them quite glaring. Indeed, in many instances, quality of goods and services delivered by governments are far superior to those delivered by the private sector. Those of us who have struggled to get to a person to speak to in a large private sector organization would appreciate this point. Secondly, we must note the fundamental principle of quality in government – it is not possible to deliver “high quality” goods and services in a sustainable and sustained manner by a government agency that has “poor quality” management systems. To be sure, it is often possible to have a dysfunctional government agency deliver expected goods and services through sheer force of managerial personality and coercive persuasion. Often, agency heads in government have a limited tenure and they are acutely aware that citizens and their political masters expect instant results. Managers, therefore, ignore the required long-term institutional development of their agency and focus on the delivery of good and services in the short run. Until, of course, the public agency (organization) reaches a breaking point and only then the focus shifts to fixing the broken system. Some would argue this is what happened with the Veteran’s Administration in the US Government. A typical government performance system focuses on closing the gap between promise and delivery. Hall mark of best practice is management by objective (MBO). Literature on New Public Management (NPM), for example, urges governments to stop micro-managing by specifying processes and procedure. Instead, they are advised to specify SMART targets (where S = specific, significant, stretching; M = measurable, meaningful, motivational; A = agreed upon, attainable, achievable, acceptable, action-oriented; R = realistic, relevant, reasonable, rewarding, results-oriented; T = time-based, time-bound, timely, tangible, trackable). As one can see, this advice is focused on the end results and assumes that what gets measured gets done. Since there is no mention of improving quality of systems that deliver the results, they tend to get ignored. Hence, it is important to include “improving quality of management systems” as an explicit goal in a performance management system. This leads to the next set of logical questions about quality of government management systems – what to measure, how to measure, when to measure and who should measure the quality of management systems in government. After reviewing international experience and examining various options, Government of India decided to ask all 80 departments at the federal level to obtain ISO 9001 certification. Since then, this standard has been updated and the latest standard is referred to as ISO 9001:2015. ISO 9001 lays down the quality requirements your management system must meet, but does not dictate how they should be met in any particular organization. This leaves great scope and flexibility for implementation in different business sectors and business cultures, as well as in different national cultures. Like the Baldrige Performance Excellence Program (BPEP) in USA, India has its own quality management system developed by the Bureau of Indian Standards (BIS). However, Indian Government preferred to implement ISO 9001 as it is internationally recognized and it is audited by highly reputable international companies. This gives this certification great deal of credibility. US Government too has also supported ISO 9001 implementation for a long time. In 1997, the General Services Administration’s Office of Property Management—with a $1.5 billion budget at the time— claimed to be the first US federal agency to become ISO 9000-certified. Both NASA and the Department of Defense of USA have cited ISO certification as an important means of improving quality and reducing the federal burden in quality system oversight. In October 2006, the US Federal Aviation Administration claimed bragging rights as the largest federal organization to achieve ISO 9001 certification (with national and international sites comprising nearly 6,500 employees). The US and India approaches differed in terms of degree of coverage and leadership. 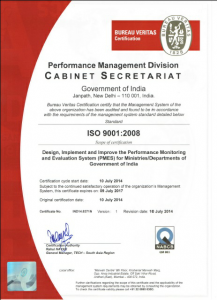 Unlike US, in India all federal government agencies were required to get ISO 9001 certification. Further, this was led by the Cabinet Secretariat in the Prime Minister’s Office. As evidence of high level political commitment, please see the ISO 9001 certificates obtained by India’s Prime Minister Mr. Modi when he was Chief Minister of Gujarat in India. Similarly, the then Prime Minister, Dr. Manmohan Singh, also supported the ISO 9001 certification of all departments, starting with the certification of the Performance Management Division (PMD) under his direct charge. Aim high. Government must decide an internationally recognized set of quality standards and do not develop standards to suit your lower aspirations. Otherwise, it will become a self-fulfilling prophecy and government departments will be stuck in a low-level equilibrium for quality systems. Preach what you practice. As nodal department for Performance Management. 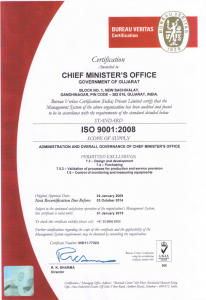 Prime Minister asked us to obtain ISO 9001 certification before asking other agencies to do so. This allowed us to have real experience and empathy for effective advice and implementation. Eat the elephant one bite a time. Implementing ISO 9001 in large departments can be overwhelming and distract from the real work. Hence, implement in stages within the department. Covering a few divisions or sections at a time. Prime Minister Modi started with the ISO 9001 certification of his own office as Chief Minister before asking others to do so. Make it an organic part of the system. Embed the implementation of ISO 9001 certification in the overall performance management system. It should not be over and above the performance goals but one of the goals. More importantly, monitor the implementation of the action plan to cover the entire department. Clear Guidance: These efforts have succeeded where government has given clear guidance. Hence, one must prepare effective guidelines and training material for government agencies and help them recruit quality consultants.